You can see it in her face. Mrs. Butterworth is *guilty*. GUILTY! She always seemed a bit too sweet. If this isn’t simultaneously the funniest and stupidest idea I’ve ever had, I’d be happy to entertain alternate nominations for those superlatives. Anyway, Colonel Mustard looks like a bitter pill. If Mr. Plum turns up dead tomorrow, it will be because he was in the icebox looking delicious, so sweet and so cold. This entry was posted in comic and tagged anthropomorphic food, clue, comic, condiments, death, food, funny, murder, murder mystery, parody, spoof, waffles, whodunnit on April 6, 2018 by littledragonblue. Dragon Comics: Guest Comic 1! I’m so tired I can’t tell if this looks right. A couple months back, the Fox asked if I was interested in fan art of my comic. Oh, my goodness! Who wouldn’t be? He said it was OK to save his drawing for a day when I just couldn’t get a comic out, and this seems to be that day. I have a massive headache, I’ve hardly slept all weekend, and I’m so tired I can barely thing, so here it is: Fox Comics! The Fox is a rather talented writer and artist. He certainly has the “bizarre realities that can only exist in comics” down to an art. There’s a little joke between us here, as he is of the opinion that if it tastes good, you should eat it, while I have been largely sugar and gluten free for about 5 years. I’m not saying that I never have a piece of cake, but generally I eschew carbs in general, and flour and processed sweeteners most particularly. I just feel better that way. So, although we are very good friends with many things in common, his “Eat all the things!” attitude clashes with my “At least 80% healthy” diet. I love the drunk-looking cupcakes, the flying pie, and whatever is going on between the tiered cake and the fork. Green Jello kind of freaks me out, though. If you are on Furaffinity, you can see some more of his drawings here, but you have to register with the website to get at the content. Most of this afternoon, I was concentrating on my first professional photography gig! The model was a bit shy at first but opened up and was soon enjoying herself. We were shooting for about 3 hours, including some short breaks. Originally, we had planned to use a my friend’s swanky house in the suburbs for half the shoot, and then hike a bit into Saguaro Park West for the second half, but we ended up getting so into it that we never left the house. I think the client is going to be very happy with the results. 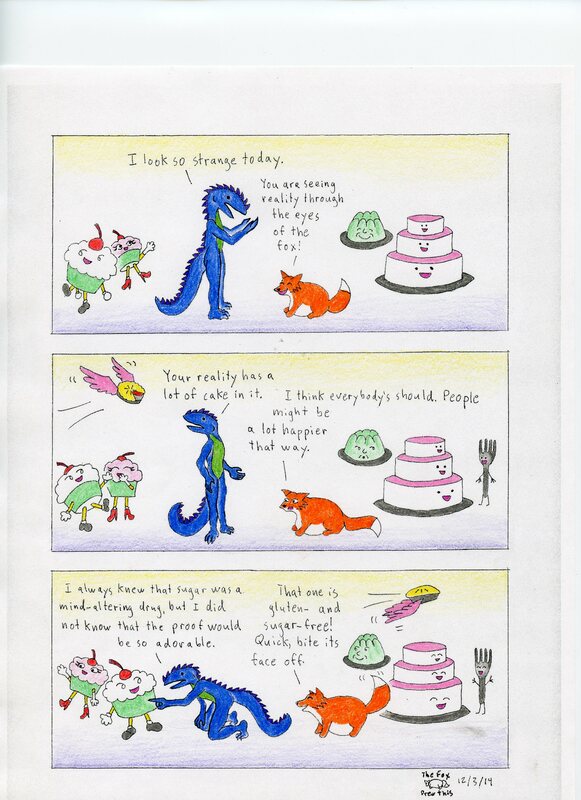 This entry was posted in Comics, dragon comics and tagged anthropomorphic food, cake, comics, dragon, eating, food, fox, guest comic, webcomic on February 23, 2015 by littledragonblue.